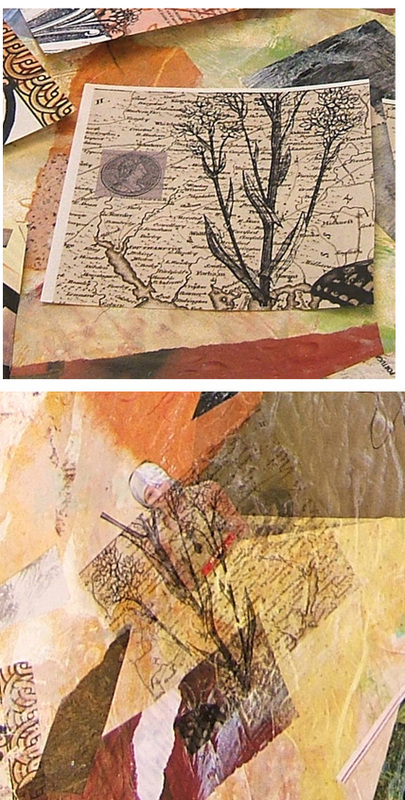 Here are more steps to my intuitive collage process. Since I’ve taken so many pictures, I need to break this up into three separate posts in order to try to be considerate of everyone’s internet connections. I am keeping the pictures as small as I think is possible to show detail. 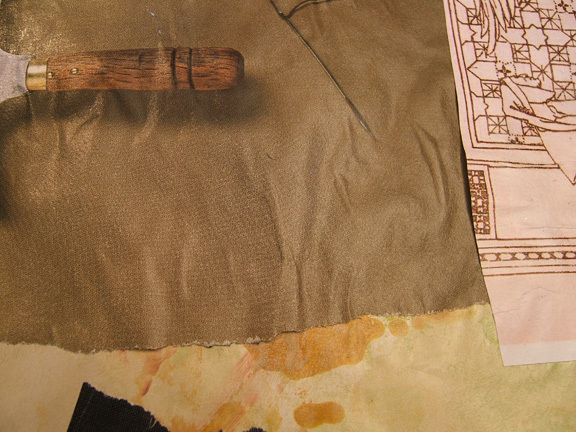 After the background sheet has dried, I will begin working on the areas that have either curled up or wrinkled. As I mentioned yesterday, I’ve been generous with the application of acrylic gloss medium for a reason. 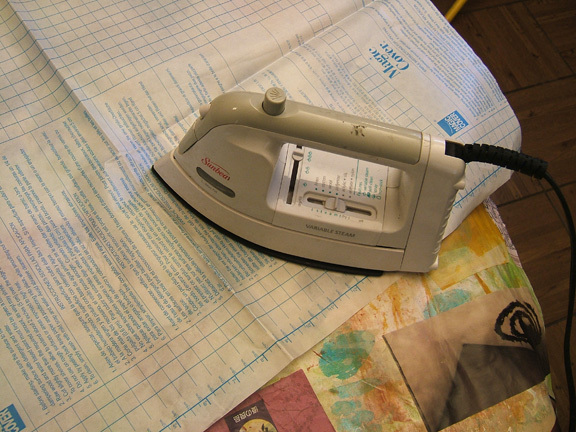 I am now going to use the iron to flatten the whole sheet and remove as many wrinkles as possible. Areas that didn’t quite stick will now stick with the application of heat, as long as there was acrylic medium on both surfaces. I save all of the throwaway backing from peel-off labels, and I also have this really wonderful huge sheet that came off the back of a roll of shelf paper. The shiny surface of these sheets will not cling to acrylic paint and mediums, and is great to use as an ironing sheet. Just place it shiny side down and iron, applying a little pressure. I set the iron on the polyester setting. The table I’m using is bare wood with a protective sheet of heavy paper over it. Here is an example of an area that had a lot of wrinkles. 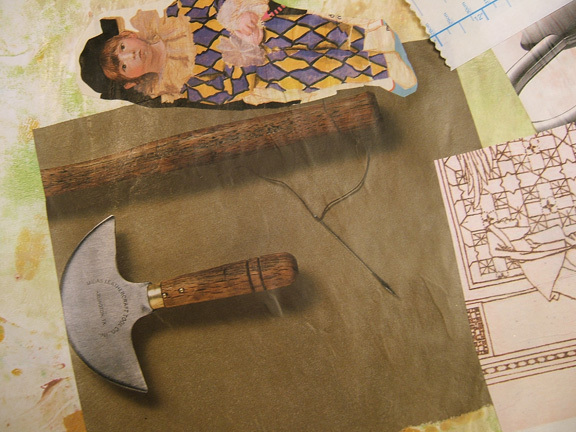 The 3D tool on the left is part of the magazine picture! After ironing it down as smoothly as I can, I then burnish it gently with my fingers once it has cooled enough to handle, but is still very warm. And here it is looking much smoother. I’ll repeat this all over the sheet, making sure I smooth everything. After the whole sheet is dry and smooth, I will add some random brush strokes in off white. They can be any color. The idea is to add interest and integrate the various parts even more. 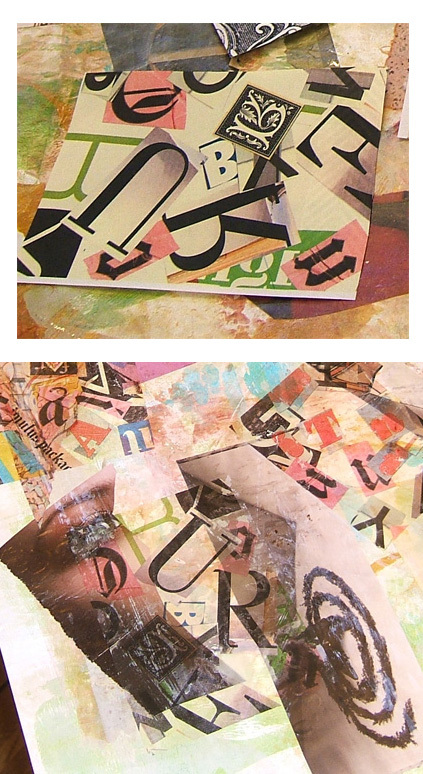 Next, I’ve printed some of my collage sheets onto T-shirt transfers and cut them into smaller pieces. These are going to be placed in areas where I think they would help the composition. Notice I said “I think” — because this is still a very free-wheeling endeavor at this point. T-Shirt transfers are a breeze to iron onto acrylic paint or mediums. I prefer this method over making a wet transfer. Here are three details of before and after ironing them onto the background, with the top half of each picture as the “before” and the bottom half is the “after.” I love doing the iron-ons because you can still see everything underneath. And here is another look at the whole sheet after all the iron-ons have been applied. At this point I could add more things like rubber stamps, tissue paper, more paint, perhaps pastels lightly rubbed over areas. But I think I will stop now. I like to leave a lot of the painted background showing. Tomorrow comes the most fun part — selecting my 5 x 7 compositions with a view finder. Fascinating how the layers merge. It is tempting to apply this on cloth, indeed. Eva, I don’t know a whole lot about working with fabric. 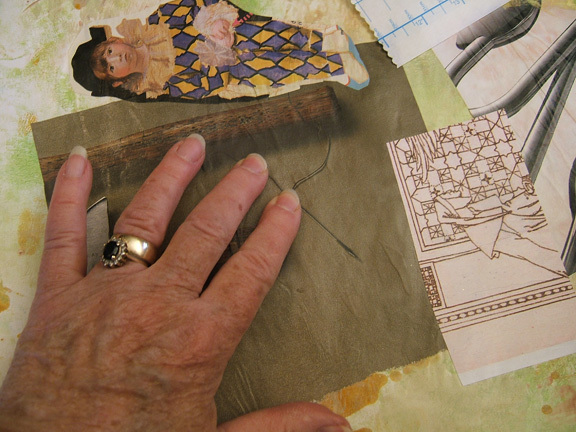 My mother was the quilter. However, I feel that if you aren’t wearing it or covering up with it, there should be no rules. 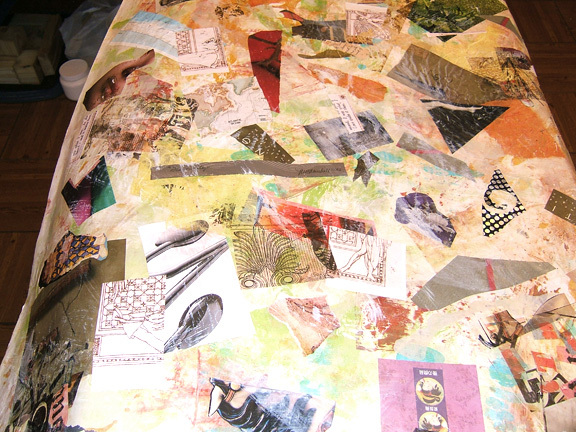 A little fusible webbing here, a little thread there, a few embellishments, and you have a fiber collage. Do you agree? Wait until tomorrow when you see how they all come together! It’s exciting to me. Have just been absorbed with series of tutes!! Another suggestion for ironing paper against the acrylic medium is freezer paper. You can find it in the grocery aisle where the sadwich bags and wax paper/tin foil are. It has a slick side and a butcher paper side. As a costumer, I used it to make patterns then lightly iron it on shifty fabrics like chiffon and light weight silk with a warm iron. It stays in place until you cut. Dina, I’ve ironed freezer paper onto fabric to stabilize it, but as you say, it was with a warm iron. It does lightly fuse to the fabric. When I’ve ironed it onto a painted surface, it fused with the paint. Since I need the iron to be on a hot setting for this, it would melt the plastic freezer paper coating. Wow, Mary Helen, what exciting ideas. I don’t have a lot of fabric in this project, but still . . . 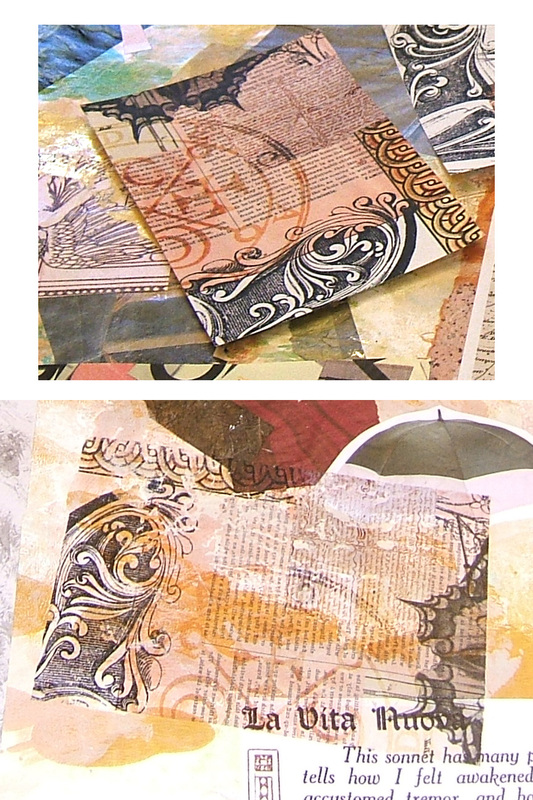 It would be fabulous to stitch these onto the paper backing! You know I won’t stop thinking about this!